Almaty (previously Alma Ata) is 7.5 flying hours from London, about the same as New York, but to the east. Until 1997, it was the capital of Kazakhstan when Astana was designated as the new first city. 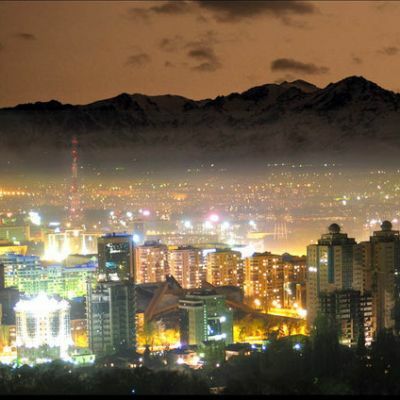 Almaty is in the mountains to the south of a country that stretches from the Caspian Sea to China and is subject to the occasional earthquake. It has huge reserves of oil. During the Soviet era, countless thousands were moved to Kazakhstan by force, so today you can find people with many different Soviet national origins. After independence numerous moved back to their newly independent countries. However there is still great diversity, including Estonian, Kazak, Korean, Kyrgyz, Latvian, Lithuanian, Russian Turkmen and Uzbek. To say the country is vast is an under statement, it is about the same size as the whole of Europe, some 2,000 miles east to west and 1,000 miles north to south. Currently about 17m people live in Kazakhstan. The only sensible way to travel is by air, the road network outside the main cities mostly no better than dirt roads. Air Astana is the national carrier, operates a fleet of modern western built airlines, Fokker 50s, Airbus family and Boeing 757 and 767s. The airline is taking delivery of more Airbus A320s starting in 2012 but will take delivery of the first of three Embraer 190 regional jets in February 2011. 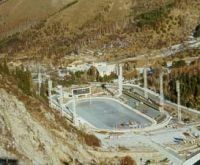 Almaty is hosting the 2011 Asian Winter Games that starts in February and nearby in the mountains work is well underway to complete all the facilities needed and the two ski-jumps are easily seen from almost anywhere in the city. I stayed in the 3-star Holiday Inn Almaty on Timiryazev Street. The hotel is situated in the downtown district about 30 minutes drive from the international airport. It has a gym, 24-hour bar, business centre and Glasshouse restaurant. Some of the rooms overlook the impressive Tian Shan Mountains. There is wi-fi connectivity throughout the hotel. 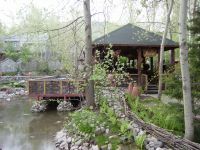 In the Ile Alatau National Park is the Tau House, part of the Tau Dastarkhan Family Resort and Spa, it is on the way to the Alma Arasan and to the Big Almaty Lake. The hotel has chalet like rooms around a landscaped central courtyard within walking distance of the restaurants including the Avlabar. You do get a completely different feel to central Almaty, it is an away from it all kind of place. There are four main restaurants, the Avlabar, Russian, Hunting and Kazakh, so if staying for a few days you will able to sample something of each culture and food. With such diversity there are plenty of different cuisines on offer in Almaty. In one instance I dined in the Alasha, an Uzbek restaurant on Ospanov Street. You arrive in what appears to be a mud brick mosque but it turns out to be a Central Asian eating house. Later they have a troupe of dancers, who demonstrate mainly Uzbek traditional dancing that clearly has connections with Turkey. With such a whistle stop tour what can be seen is limited. The Green Bazaar is a must. It is one of the best markets in the city with many spices, delicacies and even locally made chocolate on offer. Kazakhstan is one of the main Silk Road routes. It is a very busy place with all kinds of produce being prepared, from meat, bread, fresh and dried fruits of all kinds. There are even people of Korean origin, dressed in the Korean style serving Korean food. They have lost their language, their forefathers moved by Stalin, who then banned the Korean language. To get an overall view of Almaty, a visit is needed to Koktobe, a cable car that takes you to a mountain top park. You get a panoramic view of how large it is and it will strike you how many trees and green spaces Almaty has. There is a small children’s playground and zoo with rabbits and peacocks. The park has two pieces of noteworthy art, an apple because Almaty is supposed to have been where the apple was discovered and a tribute statue of the Beatles. Apple Records Ltd? A place well worth a visit is Panfilov Park especially on a sunny day. The park is where the students gather from many of the nearby universities. 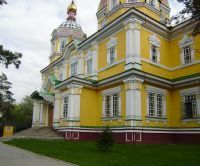 It is the location of the Ascension Cathedral also known as Zenkov Cathedral, a brightly coloured church. During Soviet times the church was used as a museum but is again a place of worship. Walking from the church, there is the Avenue of Presidents, a double line of trees, planted by all the heads of state that visit the country. 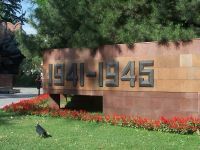 This leads to the imposing war memorial dedicated to those Soviet peoples who died in the Second World War and in particular to 28 Kazakhstan soldiers who helped to drive back the Germans near Moscow. If you really want to get away from the city then a trip in a four-wheeled car to Big Almaty Lake is the thing you must do. Be warned you do have to put your trust in the driver as the roads are no more than rock and dirt tracks. After more than one hour of bone-shaking hour slow driving passing workman repairing the mountain road the view of the lake and mountains at 7,500 feet is well worth it. You never know you might see a brown bear or two.